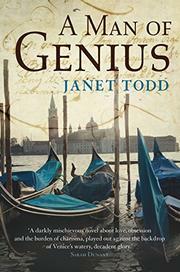 In 1819 London, a writer of gothic novels is caught up in a plot of desire, compulsion, and revenge. Ann St Clair has long made a living writing cheap, sensational novels for popular consumption. She’s unmarried and approaching middle age, but she’s established an independent life for herself: she pays for her rooms and her pleasant life without support from anyone. Then, at a dinner party, Ann meets a charismatic figure: Robert James, writer of a fragment of text considered brilliant by his small but reverential pack of followers. Ann finds herself entranced by Robert and swallowed up by his social circle. They begin an affair, but, after a while, Ann notices Robert becoming increasingly paranoid and erratic in his behavior. When he insists on leaving England, the pair travels to Venice. There, Robert only degenerates further, and Ann struggles to support him. This is the first novel by Todd, a formidable scholar of writers, including Mary Wollstonecraft and Jane Austen, and former president of Lucy Cavendish College, Cambridge. It’s an ambitious work that draws ties between its heroine’s inner state, the occupation of Venice, and the torrid gossip then arising around Princess Caroline and the soon-to-be King George. But Todd’s storytelling is jagged and uneven, and the narrative proceeds in fits and starts. The historical context is rich but might not be immediately accessible to the casual reader. Finally, it’s difficult to sympathize with Todd’s characters. Robert’s theoretical discourses might be impressive to his followers, but they come across as obtuse almost to the point of nonsense. Then he becomes so grotesque so quickly that it’s hard to understand Ann’s feelings for him—indeed, her obsession with him. Once he becomes violent and mad, why, exactly, does she feel so powerless to leave him? Todd’s work is replete with history, politics, and even philosophy, but her characters seem to lack nuance and are occasionally flat. A historical novel with a compelling premise falters in its execution.